The Innovations in Knowledge Organisation Conference (IKO) was founded in Singapore in 2015. It is organised by ISKO Singapore and curated by Patrick Lambe, Maish Nichani and Dave Clarke. The conference has run twice in Singapore, and once in Chennai, India. In 2019 we'll be holding two events, one in London and one in Singapore. 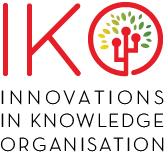 In July 2019 we will be holding an IKO case study cafe in London in collaboration with the ISKO UK Conference "The Human Position in an Artificial World: creativity, ethics and AI in knowledge organisation" - 15-16 July 2019. Visit the Programme Page for IKO London 2019. We will be holding a full day conference in Singapore on 24 September 2019, with ISKO Singapore, with the theme "Digital Transformation and Digital Workplace: Knowledge Organisation as a Core Capability". Our keynote speaker will be Eric Tachibana, Professional Service Are Practice Manager for APAC, China and Japan, Amazon Web Services, on "Digital Transformation and Innovation at Amazon: Methodology and Culture". ​Visit the Programme Page for IKO Singapore 2019.